The boys team of Cody Stone, Vance Horton, Hunter Skaggs, Dakota Vasquez, and Micah Foster finished in 3rd place. Vance finished 4th overall and Cody 5th overall, both earning a spot in the regional golf tournament on April 24th and 25th in Franskston. 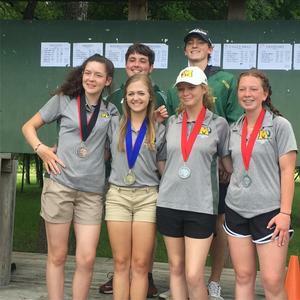 The girls team of Liz Perkins, Baylee Allen, Alisha Frost, and Jenna Herrington placed 2nd place and earned a birth in the regional tournament on April 22nd and 23rd in Frankston. Jenna Herrington finished 6th overall and Liz Perkins is the District CHAMP!!!! Congratulations to Coach Tracy Perkins and all of our Bearcat and Lady Bearcat golfers! Good Luck at Regionals!